The dependence of viscosity on the volume fraction φ of emulsion can be estimated by 4 equations, one of which is clearly wrong. Given that your emulsion will not be the perfect one loved by theoreticians, it makes little difference which one you choose - unless you are going to very high φ values. The viscosity of the stuff in the drop, ηdrop plays, unsurprisingly, only a modest role. So we might be even less interested in the viscosity of the bulk phase, η0. But here's an important point. If you increase the viscosity of the bulk phase from 1 cP to 2 cP, that trivial increase will DOUBLE the viscosity of the emulsion. This is a point that has often escaped formulators who have focussed on the other two parameters. The viscosity of an emulsion depends on the initial viscosity of the bulk phase, η 0 and the volume fraction of the drops, φ. Many equations are used to describe this dependence and three are shown here. The Einstein equation obviously is the standard for solid particles. The Doughery-Krieger formula is popular but tends to overshoot for emulsions at high φ values. It incorporates a "close packing" fraction φc at which the viscosity becomes infinite. This is OK for solids but less suited for emulsions. In the app φc is assumed to be 0.74. The factor of 2.5 is the default value for the "intrinsic viscosity" term. Because the viscosity rises exceptionally above φ=0.64 (random close packing limit) the calculation is not performed above that value. An equation better suited for emulsions is also the most monstrous - the Yaron, Gal-Or. This uses the k from the Taylor model and instead of φ uses λ=φ 0.333. It is commonly believed that smaller emulsion drops give a more viscous emulsion. The data indicates that this is largely untrue and that emulsion size effects start to become significant only when φ exceeds 0.6. For some nanoparticles the φ can be larger than thought if they take up a significant amount of the medium to become super-sized. There is also some mixing of cause and effect - at higher φ and high λ drop emulsification becomes more efficient and creates smaller drops. All you have to do is choose a range over which to plot (limited by φmax), enter η0 and, for Taylor and for Yaron, Gal-Or and Pal, ηdrop. You can read out viscosity values with the mouse. What this tells us is that to get significant viscosity increases requires φ over 0.5. 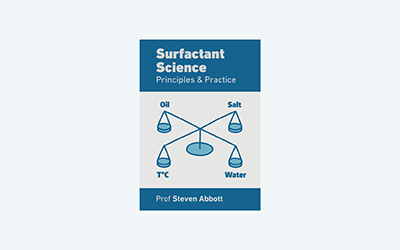 Without careful choice of surfactant this might give problems about which phase is which and avoiding phase inversion is a significant challenge. As is common knowledge, if the bulk phase is oil then η 0 can be relatively high. For those who need high viscosity from an aqueous emulsion something like glycerol can be added, or a thickener such as a cellulose or some natural gum.